Augmentation of groundwater has been practiced for centuries, to allow more sustainable use of groundwater particularly for irrigation supplies. In general, recharge is achieved through surface infiltration into shallow, unconfined aquifers. More recently, aquifer storage and recovery (ASR) has been developed to allow direct injection into deeper aquifer systems, including those which contain poor quality groundwater (brackish to hyper saline) thereby creating freshwater storage where none existed previously. The main constraint to recharge by both infiltration and injection is pore clogging from particulates, from bio-film formation and chemical precipitation. The latter is brought about by reactions between infiltrating/injectant water and resident groundwater, and between these mixtures and mineral phases, which make up the aquifer matrix. These reactions can have adverse impacts not only on pore clogging, but also on degradation of groundwater quality, for example from solubilisation of iron, or formation of dissolved sulphides. 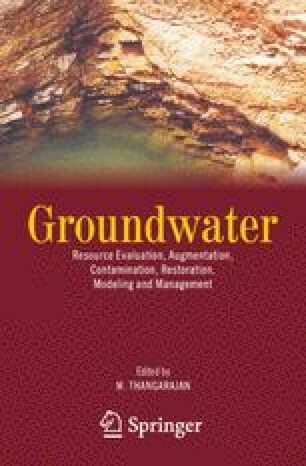 Examples of approaches used to assess possible impact on groundwater quality are presented for an arid region in NW China where an assessment was made of storage of treated sewage effluent in an intermontane aquifer system prior to re-use. This involved on-site pilot studies and modeling. Approaches involving geo-chemical modeling and assessment of likely impacts of injection of potable water in confined aquifers in less arid southern Australia will also be presented, highlighting the difficulties in predicting reactions where little is known of the reactivity of injectant and groundwater with aquifer mineralogy.